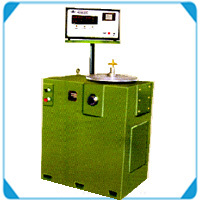 Machines Model HDVTM are Vertical type single plane hard Bearing Balancing Machine provided with Microprocessor based measuring panel HDVM – 8500 for balancing Disc shaped Rotors such as Clutch Plates, Fan Blades , Fly Wheels, Magnetos, Grinding Wheels, Impellers etc. Where as HDVTM are vertical type two plane Hard Bearing Machines provided with Microprocessor based measuring panel HDVTM – 8500 for balancing spinning pots, Spinning spindles etc. Both type Machines feature a very simple operation. The working cycle is fully automatic From safety point of view a double press push button starts machine, measures, and stores the unbalanced values on DPMS and stops machine. Keyboard facility provided on measuring panel for correct Data feeding of Rotor with one digit accuracy for its dimensions like ‘RAD’, +1, for single plane & w, d, r1, r2, +11, +12 for two plane machines. When Rotor is balanced within the limits respective LEDs glow up, indicating no further correction is necessary. 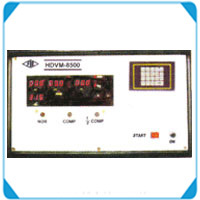 For other details please refer standard features of measuring panel HDVM and HDVTM. 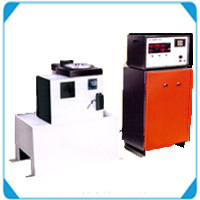 Both type of machines are provided with electronic companion software to compensate the unbalanced effect due eccentricity between rotating ( Spindle ) axis & adaptor (Rotor) axis. Data of rotor dimensions and balancing tolerance i.e. values of A,B,C,R1,R2, t11,t12 are fed by key operation. Hence accuracy of data feeding is accurate up to 1 digit. Vertical drilling attachment with drilling – thrust compensation. Horizontal drilling attachment with drilling thrust compensation. A matrix printer can be connected through ‘FIE’ software.